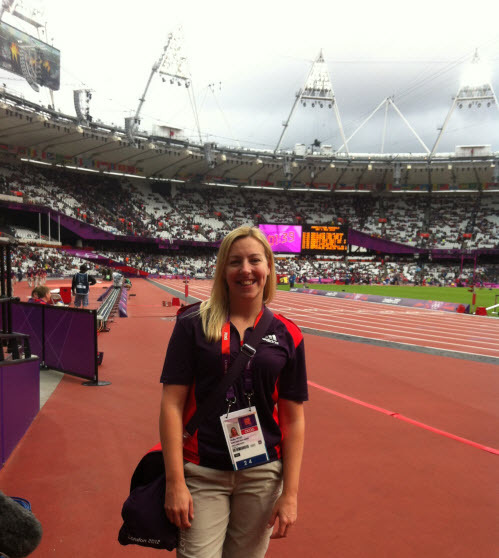 Saturday 4th August was a huge day for me - not just because it was my birthday but because it was the day I started my first shift as a Games Maker in the Olympic Stadium Press Operations, Mixed Zone team. I couldn't help feeling nervous that morning as I approached the press work room where I'd been told to check in. Luckily I bumped into Barry, another volunteer who I'd met on the venue training day, so I didn't feel totally out on my own and my nerves quickly turned to excitement when we met the rest of the team, explored our new 'office' and took some photos on the field of play. Looking back now I can't believe how lucky I was to be given such an amazing job - I was there, in the centre of the action, seeing joy, tears, pain, elation and hurt as hundreds of journalists, keen for a story, thrust Dictaphones in the faces of the athletes to get those all important quotes. - Hearing the National Anthem play for Mo Farah that last night as the event came to a close. It was a fitting finale. Finally, meeting the wonderful, fabulous people who worked the mixed zone and press operations team alongside me; some had done this before and others, like me, just jumped in and got on with it. It was a once in a lifetime experience and it was amazing. I can't express how proud I feel to have been part of London 2012. Would I do it again? Anyone know flight times to Rio?